/ˌtran(t)sfərˈmāSH(ə)n/ – a thorough or dramatic change in form or appearance. /rēˈbərTH/ – the process of being reincarnated or born again. LSC Communications, the spin-off from RR Donnelley, has embarked on an acquisition campaign that appears to herald the fundamental transformation of LSC Communications less than a year after RR Donnelley split into three publicly traded companies. Arguably the more traditional of the three now separate companies, LSC Communications primarily prints magazines, catalogs, books, directories and retail inserts. Even its chosen name, LSC Communications (“LSC”), derives from The Lakeside Classics, the annual Christmas time publication and production of unique hardcover case-bound books. The first edition, published in 1903, was the Autobiography of Benjamin Franklin, followed in 1904 by a reprint of all the Presidential inaugural addresses from Washington to Lincoln, and in 1905 all those up to Teddy Roosevelt’s. Published every year since, future topics focused on American history and first-person narratives. The books were never sold, only given to employees, customers and friends of the company. 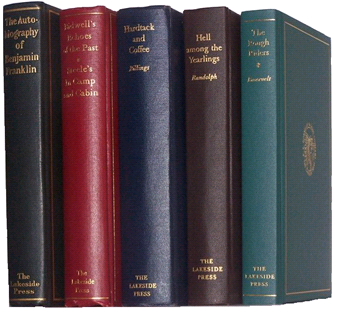 The highly collectible books were printed and bound, with simple cloth covers and gold leaf stamping, in the Lakeside Press building in Chicago, hence The Lakeside Classics. From this history-steeped tradition, LSC Communications was launched in 2016 and now begins anew to transform itself. In what appears to be a move to diversify away from the print-manufacturing-centric product mix inherited in the spin-off from RR Donnelley (“RRD”), LSC Communications announced the acquisition of Creel Printing, a relatively large (2016 revenues of $130 million) commercial and digital printer headquartered in Las Vegas. Creel has invested heavily in digital printing, with one of the largest fleets of HP Indigo presses, including the digital print capabilities acquired when it purchased Global Soft, an early innovator in total digital print production. The acquisition of Creel will likely bring LSC Communications into direct competition with many of the commercial printing operations now part of the legacy RRD company, especially the former CGX companies that remained with RRD in the split. With Creel’s digital platform as the foundation, we suspect that the potential to produce personalized magazines at scale is not too far in the future for LSC. When the three companies were formed last year, industry analysts noted with surprise that RRD’s Logistics Solutions business unit remained with RRD. The logistics business provides postal optimization services such as commingling and co-palletization that often are the differentiating factors that prevail when bidding magazine printing contracts. And despite this obvious relationship, the RRD business did not include the publication printing business – that product line was spun out into LSC. That gap was plugged in July when LSC announced the purchase of Fairrington Transportation, the industry’s leading independent provider to the printing industry offering postal savings through logistics solutions. In another move to bolster its front-end service offerings to publishers, LSC Communications announced an equity investment and reseller agreement with Authors, Inc., a company that offers machine learning and artificial intelligence applications for publishers. The company’s software analyzes editorial content to improve writing style, predict marketability, recommend keywords and re-calibrate metadata based on past performance. Now that’s transformational! Speaking of transformation, Quark Software, parent company of the once ubiquitous printing industry page layout software Quark Express, was sold to private equity firm Parallax Capital Partners. At one time, Quark had a 95% share of the market for page layout software, but has faded to a distant second-run position under the pressure from Adobe’s InDesign. In the meantime, Quark has reinvented itself as a content management and content automation platform, enabling large organizations to create, manage, publish and deliver business-critical content. No longer confined to the printed page, Quark products are now used for multi-channel communications. Quark Express is still offered, but is no longer central to the company’s success, a rebirth that speaks to the fundamental changes throughout the industry. Another company transforming itself through acquisitions is Montreal-based envelope manufacturer Supremex. The company acquired Stuart Packaging, a manufacturer of folding cartons, which is also based in the Montreal area. The acquired company serves the higher end of the market, focusing on cosmetics, health & beauty, and pharmaceutical packaging. The deal for Stuart followed a few months after Supremex announced the acquisition of Durabox, a manufacturer of much simpler corrugated boxes such as those used for take-out pizza. Supremex, which has also acquired other envelope manufacturers in the past two years, is clearly focused on transitioning from its core business of stock and custom envelopes. The company’s CEO noted that the envelope business has been in decline and under accelerating margin pressure, motivating the strategy to move into packaging via a targeted acquisition strategy. Jersey City-based DG3, with support from its new equity sponsor, Resilience Capital, acquired Leycol Printers in London and merged the operation into DG3’s existing UK business. Resilience has been in the DG3 investment since August 2016 (see The Hyde Opinion – September 2016); this is the fund’s first bolt-on to the DG3 platform. NextPage, the Kansas City printer formed in 2013 with the merger of three regional print providers, acquired nearby Burns Printing which will be tucked into NextPage’s facility. It’s a unique place to work, located 150 feet underground in SubTropolis, the extraordinary six million square feet industrial facility located in a former limestone mine on the outskirts of Kansas City, Missouri. Emprint/Moran of Baton Rouge, Louisiana, acquired the assets of Hauser Printing through the bankruptcy court in the Chapter 7 liquidating bankruptcy filed by Hauser in February 2017. Emprint/Moran will remain in Baton Rouge and operate an additional location from the former Hauser location in New Orleans. Multi-Color Corporation announced that it is acquiring the Constantia Labels division of Constantia Flexibles. Representing $690 million of the total $2.36 billion revenues of Constantia, the acquisition will bulk up serial acquirer Multi-Color to approximately $1.6 billion in annual revenues with a projected EBITDA of $300 million. Multi-Color paid $1.3 billion for the label business, equal to 10.25 times pre-synergy forward EBITDA. If estimates of synergies to be gained are realized, the multiple paid will drop to 9.2 times forward EBITDA. Both the size of the acquired line of business and the reported 18% EBITDA are credited in the explanation of the relatively high multiple paid for the acquisition. Jet Label, based in Edmonton, Alberta, the self-proclaimed “largest label printing company in Western Canada” grew larger still with the acquisition of United Label Company. The company plans to maintain and grow the United operations, located in the Vancouver suburbs. The combined companies will have a fleet of flexo and digital presses producing food and beverage labels, with a specialty in waterproof and weatherproof labels. C+C Packaging in Farmingdale, New York has acquired the business of General Die & Die Cutting,* formerly located in Roosevelt, New York. With expertise in the structural design and manufacturing of folding cartons, two principals and several employees of General Die have moved to the C+C facility, bringing customers and selected equipment with the sale of the business. The acquisition is one more step in the transformation of the former C&C Bindery & Die-cuts from a trade services bindery to a full-service folding carton manufacturer. * Graphic Arts Advisors, publisher of The Target Report, served as exclusive advisors to General Die & Die Cutting in this transaction.